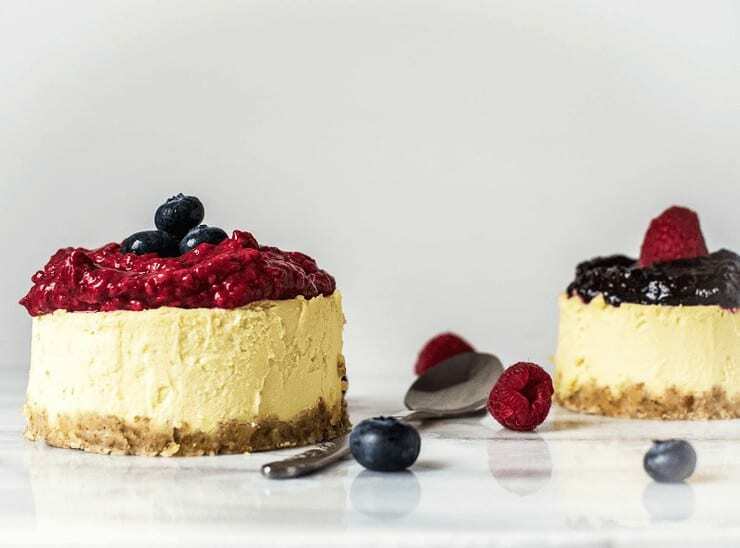 I love this easy healthy no bake mini berry cheesecake! It's one of my favorite desserts with it's fluffy texture and creaminess that melts in your mouth. 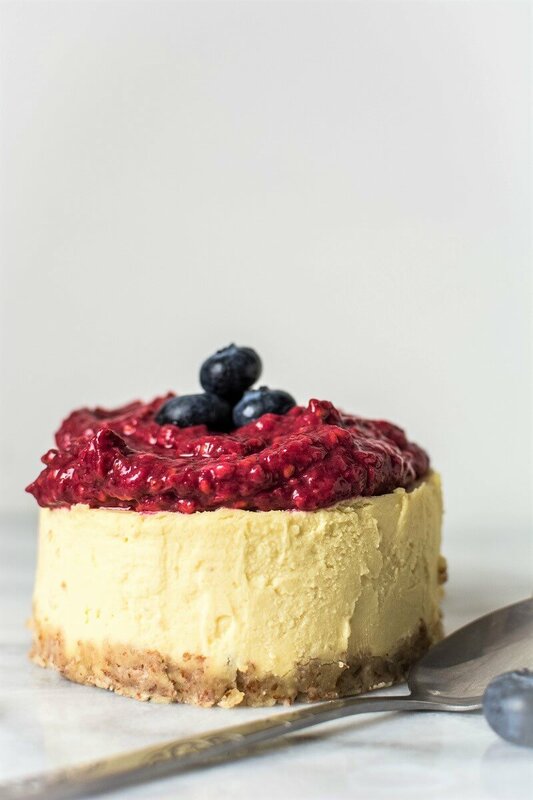 Of all the classic desserts, I love cheesecake the most….especially this easy healthy no bake berry cheesecake! 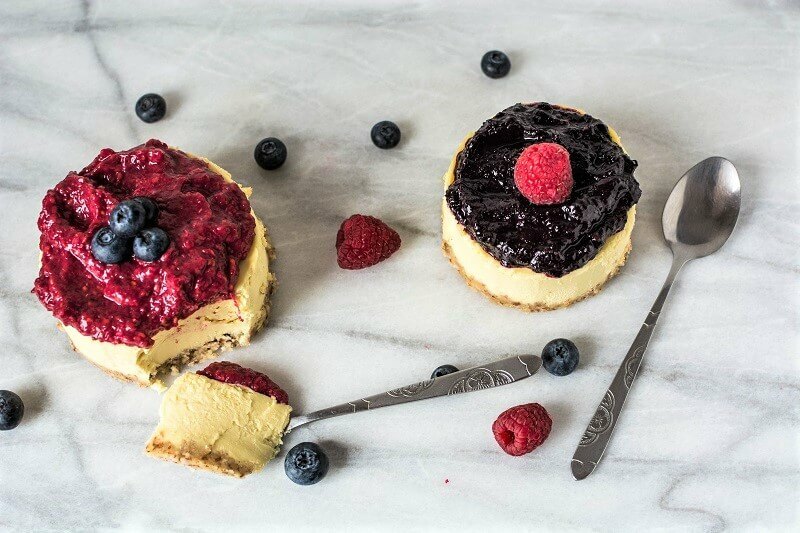 There are so many flavors of cheesecake like pumpkin and chocolate, but a classic one with berries on top is so delicious! That moist and fluffy texture, the creaminess that melts in your mouth… You know what I’m talking about, I’m sure. 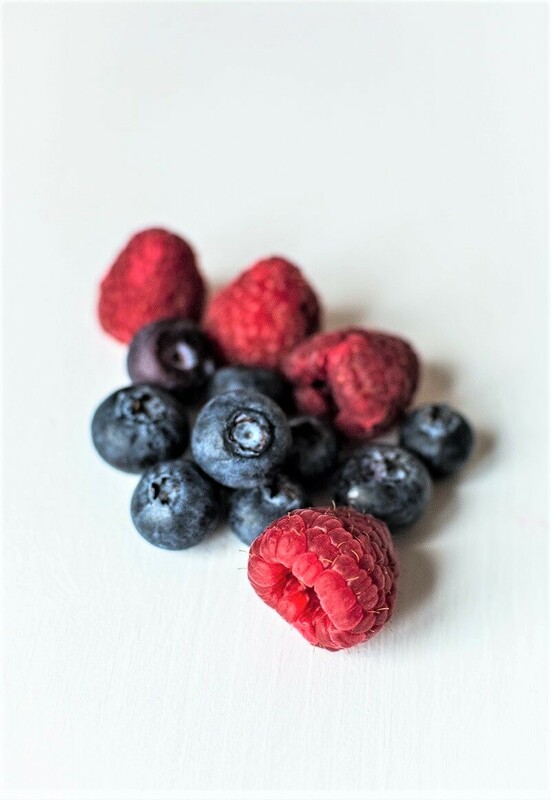 You can easily imagine my joy when I got the same texture and delicious taste with healthy ingredients like cashews, coconut cream, honey, lemon juice and berries (not exactly the same, of course, but amazing in a different way). 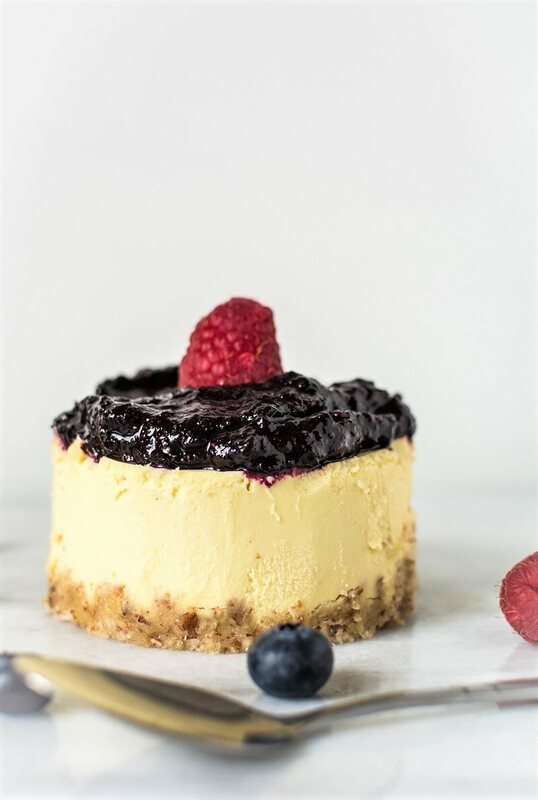 This no bake mini berry cheesecake recipe is paleo, vegan and doesn’t contain any refined sugars or flours, no dairy, no gluten and yet you still get a great dessert. Sounds really good, right? And the options are endless for this cheesecake recipe because you can make any combination that you want. You can use any type of berry or fruit, natural extracts and flavors to give your cake the aroma and taste you want. You can switch it up to be a strawberry cheesecake or even a lemon or chocolate one! Plus, the best part is that this dessert is so nourishing that you’ll only need to eat a small slice to feel completely satisfied. You can even share the mini cheesecake with another person to enjoy it together. Place the almonds in a food processor and grind until they resemble flour. If you prefer a crunchier crust just leave them roughly chopped. Add the dates or honey plus coconut oil, and process until you have a sticky dough. Place two cake rings on a platter. Two small different sized cake molds that were about 41/2 inches and 5 1/2 inches were used for this recipe. If you use two 4-5 inch mini molds, that should work fine for this recipe or possibly one 8inch mold. 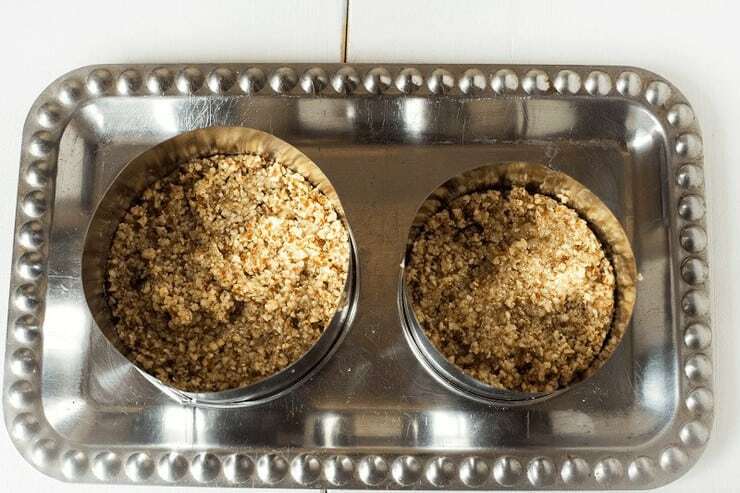 On the bottom of each cake mold press the dough evenly, and take the platter to the fridge until you prepare the filling. Place all the cashews, coconut cream and oil, 2 1/2 tablespoons of honey, orange and lemon juice, vanilla and cardamom in a high-speed blender or food processor. Blend until smooth and creamy. Divide the filling between the two cake rings and take back to the fridge for at least 2-3 hours. If you want to enjoy the cheesecakes faster, place them in the freezer for at least 1 hour. Mix each berry puree with 1/4 tablespoon of honey, and spread on top of the cakes to serve. I’ve never tried a vegan cheesecake but this makes me want to!! 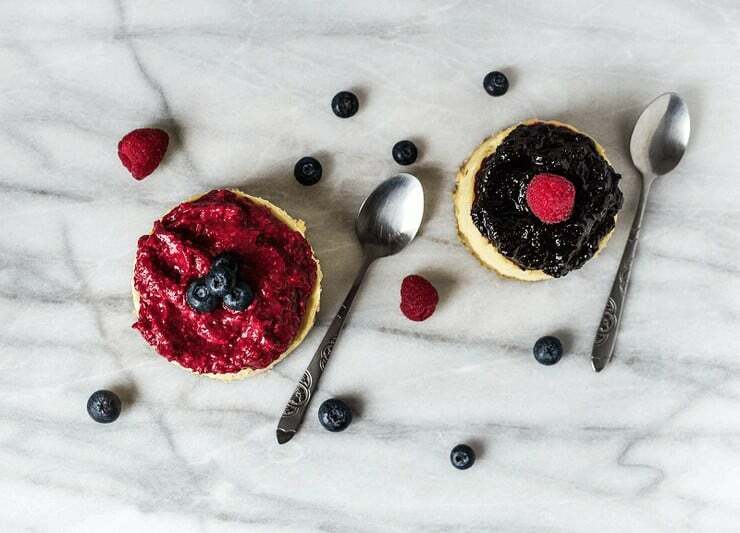 These cheesecakes are beautiful and looks so delicious! Love the berry puree on top of these cakes. Thank you for sharing this recipe! 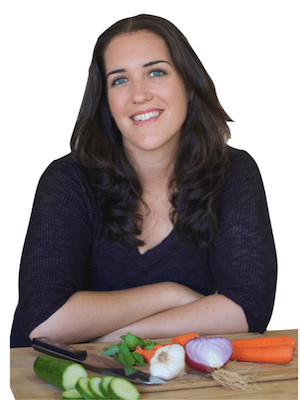 I love finding beautiful gluten free recipes! The puree has such a beautiful texture. A winner for sure! Wow…..these looks absolutely amazing!!! So pretty, and nourishing too! 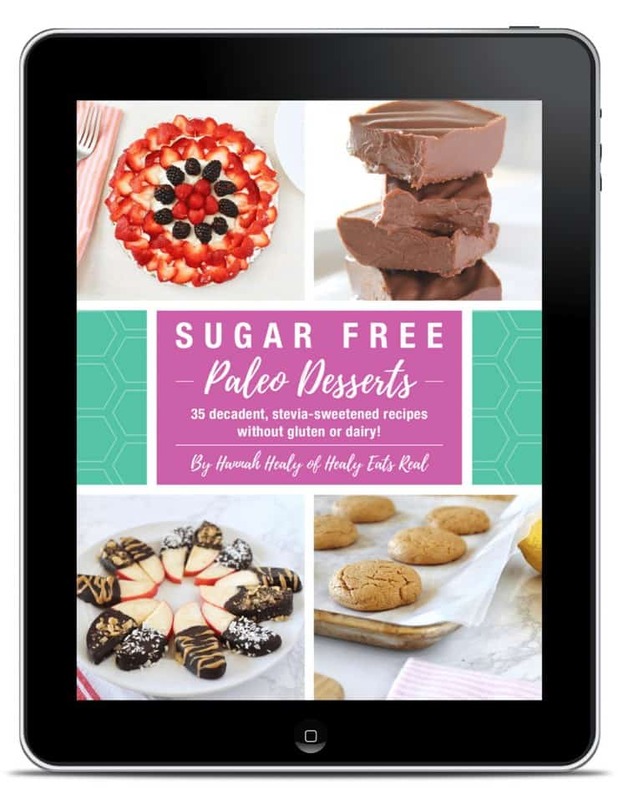 I love paleo desserts, they are so guilt-free! 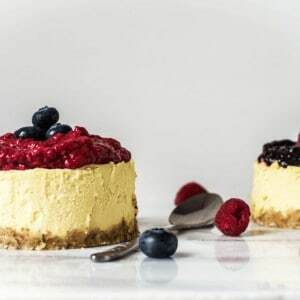 These cheesecakes look so rich and delicious! what size cake rings did you use? Two small different sized cake molds that were about 41/2 inches and 5 1/2 inches were used for this recipe. If you use two 4-5 inch mini molds, that should work fine for this recipe. Or possibly one 8inch mold. I like how you have used nuts like almonds and cashews in the recipe. Just makes it more healthy ! What size cake rings did you use, it would help to make sure the cheesecake comes out full not flat.